Demonstrating their shared legacy of innovative research and commitment to patient-centered medical technology, Purdue University, University of Notre Dame and GE Healthcare announce a proprietary new CT scanning reconstruction technology called Veo™ that may enable physicians to diagnose patients with high-clarity images at previously unattainable low radiation dose levels. Dr. Charles Bouman, Professor of Biomedical Engineering, is one of the leading professors on the collaboration. CT is an advanced form of spiral X-ray technology that physicians use to help diagnosis disease in their patients – including cancer, cardiac and neurological diseases, and other conditions – with the goal of significantly improving treatment plans and patient health outcomes. Since it was invented in the 1970s, CT scanning has positively impacted millions of lives. Still, physicians and patients have traditionally had to balance the tremendous benefits of CT with the patient's exposure to the limited medical radiation dose used during scanning. Veo is helping change the equation by helping health-care professionals provide accurate diagnoses with high-clarity images at astonishingly low radiation dose levels. "Veo technology is a game-changer, plain and simple," said Steve Gray, vice president and general manager of CT and Advantage Workstation for GE Healthcare. "Traditionally in CT there has been a need to balance image quality for diagnostic purposes with the lowest achievable radiation dose. We are hearing from our customers that GE is changing the rules of CT with Veo, delivering remarkably clear images at unprecedented low dose levels." The world's first Model-Based Iterative Reconstruction technology, Veo is built on an advanced algorithm that was developed jointly by researchers at Purdue, Notre Dame and GE Healthcare and is the subject of numerous U.S. and international patents and patent applications. The three organizations signed an exclusive license and commercialization agreement on Monday (Nov. 28) allowing Veo and the underlying MBiR technology to be commercialized by GE Healthcare. "The development of this discovery is another excellent example of how a collaboration between Purdue and another institution, in this case Notre Dame, as well as an industry leader like GE Healthcare, has resulted in a viable product that is being commercialized," said Joseph B. Hornett, senior vice president, treasurer and COO of the Purdue Research Foundation. "Last year, we signed 85 commercialization agreements to move Purdue discoveries to the public." "We're pleased to have our engineering research contribute to a viable new product, particularly in an area so critical to our economy and our well-being as revolutionary medical diagnostics devices," said Robert Bernhard, vice president for research at Notre Dame. "We see the Veo project as a great example of close collaboration of university and industry." Charles A. Bouman, Ph.D., the Michael J. and Katherine R. Birck Professor of Electrical and Computer Engineering and a professor of biomedical engineering at Purdue University, and Ken Sauer, Ph.D., associate professor of electrical engineering at Notre Dame, developed the technology over the past two decades in collaboration with Jean-Baptiste Thibault, Jiang Hsieh and Zhou Yu. Thibault and Yu worked on the technology as graduate assistants under Bouman and Sauer and both currently work for GE Healthcare. "Conventional CT scanning takes thousands of views from different angles to 'see' organs and then creates a 3-D image of the person," Bouman said. "Veo takes radiographic images digitally that use less X-ray. A reduction in X-rays means the radiation dosage is reduced. Then, our computer algorithm uses model-based reconstruction more effectively so we can form a high-quality image with less radiation. "Basically, Veo cleans up the noise or graininess and creates a sharper image." After simultaneously completing their doctorates at Princeton University, Bouman and Sauer began working on the technology as assistant professors at Purdue and Notre Dame. "Our opportunity to work closely with our collaborators at GE Healthcare was immensely important in getting these imaging ideas into the scanners," Sauer said. "The fact the Jean-Baptiste and Jiang committed themselves to guiding this project and had direct access to other experts on every facet of the machines really tightened the feedback loop on algorithmic improvements." Funding for the research came in part from the National Science Foundation and GE Healthcare. "Given increasingly complex clinical demands and the traditional trade-off between CT image clarity and patient exposure to medical radiation, the efforts to develop and test Model-Based Iterative Reconstruction (MBiR) were critical," said Jiang Hsieh, CT chief scientist for GE Healthcare." 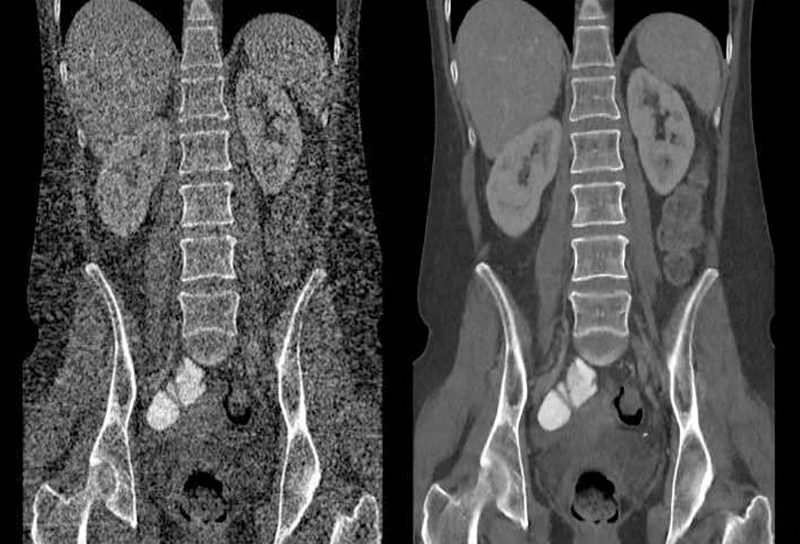 In clinical practice, the use of Veo may reduce CT patient dose depending on the clinical task, patient size, anatomical location and clinical practice. A consultation with a radiologist and a physician should be made to determine the appropriate dose to obtain diagnostic image quality for the particular clinical task. Veo is a trademark of General Electric Company. The University of Notre Dame provides a distinctive voice in higher education that is at once rigorously intellectual, unapologetically moral in orientation and firmly embracing of a service ethos. Founded in 1842 by a priest of the Congregation of Holy Cross, Notre Dame is an independent, national Catholic research university located adjacent to the city of South Bend, Ind., and approximately 90 miles east of Chicago. The Fall 2011 edition of Engineering Impact featured the work of Professor Pedro Irazoqui and the Center for Implantable Devices. The mission of the center, which recently marked its first anniversary, is to lead the research, development, and translation of implantable medical devices; formalize collaborations between faculty, clinicians and commercial partners; and to maximize clinical impact. In short, the research faculty are teaming with clinicians and commercial partners to solve medical puzzles. To read the full article, please go to Engineering Impact. For more information on the Center, its associated researchers, and current projects, please visit the Center for Implantable Devices. John A. Pearce, Purdue University alumni and current Weldon School of Biomedical Engineering Advisory Board Member, was recently named among the top 10 most inspiring professors by Texas Exes for his "soulful teaching style, even while teaching Electrical Engineering." Dr. Pearce received the honor from The University of Texas at Austin Alumni Magazine. Dr. Pearce currently teaches Electrical Engineering, where he has been observed to teach with the spirit and soul of a Literature Professor, even while teaching and explaining the delicacies of Electrical Engineering. Former students have said that while other professors taught them how to have the brains of an engineer, Dr. Pearce has been the only professor to show them an engineer's soul. Dr. Pearce understands that Electrical Engineering is difficult for students, but he conveys to them the importance of understanding all of the finer points. "We have to be extremely careful about what we do," Dr. Pearce explains, "because if we're sloppy, people get hurt." The University of Texas at Austin has implemented a slogan that states, "What starts here changes the world." Dr. Pearce defends this by saying, "At universities, that's what we do. We teach students how to apply powerful technological tools to improve life for everybody. That's the coolest thing I can think of." Dr. Pearce is the Temple Foundation Endowed Professor of Electrical & Computer Engineering at The University of Texas at Austin. He researches interactions between electromagnetic fields and tissues, as well as industrial applications of radio frequency (RF) and microwave (MW) fields. He received his bachelor's and master's degrees in mechanical engineering from Clemson University, and a master's and PhD in electrical engineering from Purdue University. Four Purdue Weldon School of Biomedical Engineering students are taking classes in Galway, Ireland during the Fall semester of 2011. These students have begun their senior design projects while they are in Galway, with the assistance of NUIG faculty members. In the second semester the students will return to the Purdue campus and complete these projects with their senior design teammates. The following is the first progress report from one of our students. Dia daoibh! Is mise C.W. Peak. Hello! My name is C.W. Peak. I am senior in Purdue’s BME program currently participating in the Weldon School of Biomedical Engineering’s first exchange program with the National University of Ireland Galway (NUIG). 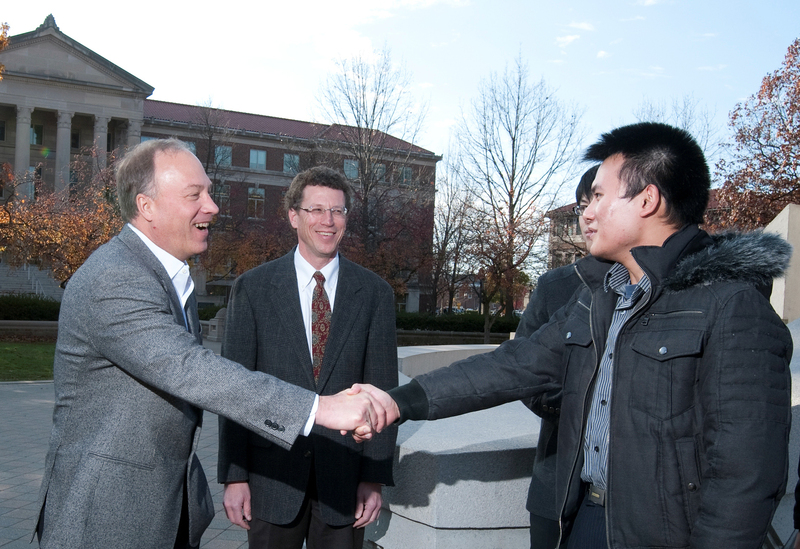 This is an exciting time to be a Biomedical Engineer at Purdue. The global contacts and reach of the program is expanding and it is great to be a part of it. Here I will share some of my experiences to date—academic, travel, and cultural. The biggest difference thus far at NUIG is that there are no mid-terms! This is obviously drastically different than Purdue’s system. Rather, the final counts towards most of the grade (in some courses I have small homework assignments that make up 10% max). I feel like I am on par with my Irish engineering counter parts. The Finite Element class (ME501—takes the place of BME401) has a lot of value in it, especially when it comes to Senior Design. Here, you also have the chance of taking some really cool courses—I’m learning Irish! With being in a new place, travel is a must! Since being in Ireland, I have gone to the Cliffs of Moher, Inis Mor Island, Dublin, and London. Each was great experience with their memorable parts. In Dublin, I represented Purdue in running the half marathon (finishing at 1:47:06). The Cliffs are an amazing site to see as was everything in London and Dublin. Galway has it’s own perks too! We’ve met some awesome people and have weekly dinners at a new restaurant to get the most out of what it has to offer. I was in two non-English speaking countries before arriving in Galway. It was nice to speak and hear English again! At the same time, I had to get used to a different sense of time and responsibilities. Coming from Germany was difficult because the culture here is very laid back, “things will eventually get done.” The hardest thing to get used to was looking the opposite way to cross the road. Overall it’s been great! I’d suggest it with no reservations to anyone that’s looking for an international experience!